Nine years after the first caravan tour we call everyone for the third time to unite, stand up in solidarity with us against the system of exclusion, oppression and deportation in Germany. This time the Caravan tour takes place shortly before the meeting of the Group of Eight countrıes in Heiligendamm, Germany. When most of us: migrants; including refugees and migrants left our destroyed countries, we did not leave as free women and men. We were forced to leave by the unbearable and inhuman conditions that have been imposed on us there. Some people have acknowledged these conditions in various forms as hunger, wars, poverty, dictatorship and so on which has its root in the systems of exploitation, injustice and perpetual subjugation and eternal dehumanisation that have become the hallmarks of the world order that the imperialists G8 (the leading capital monopolists backed up by their states or governments) are imposing on us. The wealth of the so-called rich countries of the North, especially the “Group of 8”, the Greedy 8, accrue from the massive and inhuman exploitation and colonization of our countries. At the same time the governments are building borders and electric fences to ward-off the ”unwelcomed and unwanted” from the countries they have so shamelessly and brazenly exploited. In their xenophobia or frenzy of controlling our movements, they are militarising their borders with the deadly effects of their soldiers and police shooting and killing innocent people as witnessed in Ceuta and Melilla. Not to mention police shooting and killings of blacks and other migrants in Germany. Nor the detention camps in the Canary Islands, Spain, Italy amongst others, of ‘Boat people’ who were lucky to survived the ordeals of the high seas. Of course not forgetting the construction of the United States–Mexico border like the European outside borders which are acts of murder. The Russian Government abuse of fundamental human rights like its G8 counterparts and its war of aggression against breakaway Chechnya, are all too obvious indicators of arrogance, and irresponsibilities .This war is said to be part of the so-called war against terrorism, like the occupation of Afghanistan and Iraq that the G8 states are executing. These wars are all as well consequences of the competition between these states them- selves. In the name of the international fight against terrorism, wars of aggression and occupation are justified and in course of this, people flee from the destroyed countries to safe countries where they are excluded and deported. While Europe is taking extra-ordinary steps to impede our will to cross its borders, European governments and the USA are crossing borders to exert their control in our home countries, destroying the very means of our livelihood. They export arms and ammunitions, prop and support dictatorships in our countries, and here in Europe, persecute and deport those who fight against these injustices. We are justified to say that the precursors of deportation are imperialism and capitalism. Deportation is an abuse of human right, an injustice perpetrated by the sadistic exploiters against the exploited who are hunted and slammed into the ”Lager system” to face the deportation machinery with its weapons of manipulation, mind-bending, sexual abuses, exploitation, family separations and what have you. We as the Caravan for the Rights of Refugees and Migrants with other refugee and migrant self-organisations such as The VOICE, SPI and AGIF, have been able to show in our daily struggles for basic rights that unity of people from different continents and backgrounds is possible. From Manilla to Diyarbakir, from Lome to Palestine, from Tehran to Bremen and Colombo to Berlin, we have been able to unite our common struggles because only an international dimension can strengthen our demands for freedom of movement, right to stay and above all our human dignity. 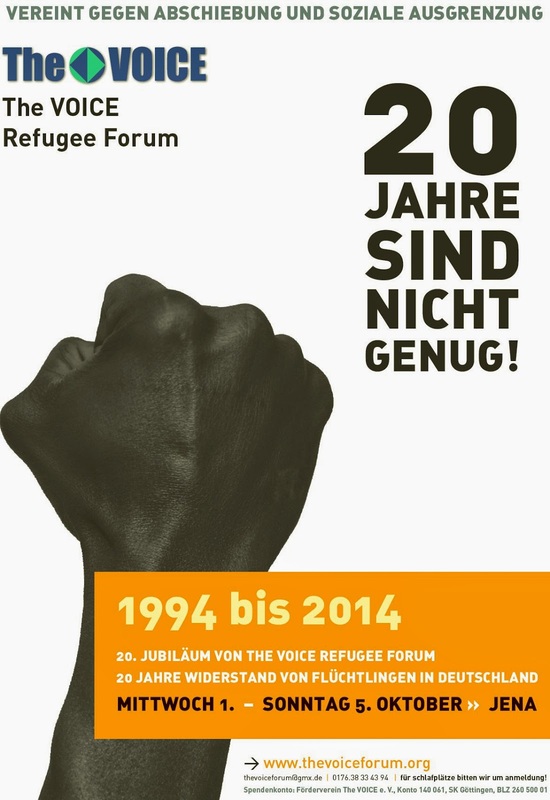 With this tour we express our freedom and overcome the internal borders imposed on us by the German government through the Residence Obligation Law against refugees (more about Residenzpflicht on The VOICE Refugee Forum). and many, many more will follow suit. but must be fought for, to be attained. is the space of our common struggle. The Caravan for the Rights of Refugees and Migrants invites you to participate in the 2007 Tour with us. We will be travelling through Germany for two weeks (May 19 to June 4,2007) before the G8 Summit. The Tour will begin in Neuburg close to Munich and will end in Rostock close to Heiligendamm, where the Summit will take place. This is how we want to show the connection between migration and the destruction of the home countries of refugees and migrants by the G8 States. we will focus on the countries of origin at every station of the tour. We also want to draw public attention to the awful situation of deportations and camps in Germany and Europe as a whole. The Tour is organised by refugee and migrant selforganizations in cooperation with the NoLager Network and other antiracist groups. Kontonummer: 127829 | Bankleitzahl: 26050001 | Sparkasse Göttingen. 09:00 to 11:00 - Continuation of the discussion in Schillergässchen 5, Jena. Opening of the Exhibition "Agrar production and militarisation"
Besides the activists from the Caravan for the rights of refugees and migrants active members of the workers unions, antiracist initiatives and antimilitarists groups are invited. Presentation of the political positions of the Caravan for the rights of refugees and migrants and other migrants self organizations from North-Rhine Westphalia with the aim to built the basis for continous local cooperation.